Objective: Evaluate the short-term outcomes of a novel synthetic ligament for treatment of naturally occurring canine cranial cruciate ligament disease. Animals: Dogs with unilateral cranial cruciate ligament disease (n = 50). Methods: Patient parameters evaluated included a five-point lameness score, evaluation of craniocaudal stifle instability, and radiographic findings over 24 weeks. Any postoperative complications were recorded. Results: Thirty-four out of 42 dogs experienced significant improvements in lameness between the preoperative and 24 week time points. Lameness scores in those dogs improved significantly at all measured time intervals after postoperative week 2. Recurrence of stifle instability increased significantly over the study period from immediate postoperative measurements. Cranial drawer recurred in seven out of 42 of dogs by week 4 and 18/42 by week 24. Implant changes were not noted between the immediate and six-month postoperative radiographs except where complications occurred. Overall, 25 dogs experienced a total of 32 complications (22 major and 10 minor). Sixteen dogs had major complications, and nine had minor complications. Conclusion: The procedure was generally effective at improving lameness scores, but did not consistently maintain postoperative stifle stability and had an unacceptably high complication rate. This synthetic ligament procedure cannot be recommended for use in its current form. Cranial cruciate ligament disease is the most common cause of hindlimb lameness and stifle osteoarthritis in dogs (1, 2). Arthroscopic placement of an intraarticular auto-graft (hamstring or patellar ligament) or allo-graft (cadaveric tendon) is the most common method of anterior cruciate ligament reconstruction in humans (3). While fundamental differences exist between humans and dogs relative to the functional biomechanics of cruciate ligaments and the pathogenesis of their injury, various graft based techniques continue to be evaluated for veterinary use because of their theoretical advantages. However, they are still not widely used in veterinary medicine, which may stem from the technical challenges of and time required for graft harvesting and preparation, the inconsistency of short and long-term stifle stability maintenance, and the highly variable outcomes reported with intra-articular techniques reported (4-10). A synthetic ligament would theoretically share the benefits of a graft-based intra-articular technique, but could also offer some distinct advantages. The lack of any requirement for graft harvesting would simplify the technique, shorten the operative times, and avoid donor site morbidity (11, 12). Additionally, a synthetic ligament would not need to undergo the four to six month ligamentization required to achieve full strength as do tissue grafts (13, 14). This obvious appeal has fostered many attempts to utilize a variety of synthetic ligaments in humans and a few trials have been performed in canine patients (15-18). However, poor long-term mechanical stability and, in some cases, marked patient tissue reactions had virtually eliminated their use in humans (19-21). More recently, improvements in implant materials, designs, and surgical techniques have generated additional clinical studies to evaluate synthetic anterior cruciate ligament reconstruction in humans (22). Among other attributes, an ideal synthetic ligament should also support patient tissue integration. Tissue ingrowth improves the viscoelastic properties of a synthetic ligament and reduces fibre abrasion, thus preventing desquamation and degradation of the prosthesis (23). To encourage tissue ingrowth, it must be made of biocompatible materials, be porous enough to permit cell entry, and be structured to act as a scaffold to support cellular growth. The objective of this bi-centre prospective study was to evaluate a braided intraarticular synthetic ligament for surgical replacement of the ruptured cranial cruciate ligament in 50 client-owned dogs over six months. The aim was to determine if this synthetic ligament technique would allow the return of functional outcomes and maintain stifle stability. Dogs sent by referring veterinarians between January 2011 and April 2012 for evaluation and treatment of acute or chronic cranial cruciate ligament disease to MedVet Medical and Cancer Centers for Pets in Worthington and Cincinnati, Ohio, were prospectively enrolled if they met the clinical study inclusion criteria. Inclusion criteria required skeletal maturity, age of less than 12 years, body weight of 20-50 kg with a body condition score of 2 to 4 on a five-point scale, and having a complete or partial unilateral cranial cruciate ligament tear. Owners were counselled on established surgical treatments versus the study procedure. Care was taken to emphasize that the study treatment was novel and that while the implant appeared to have favourable mechanical and biological properties based on company-sponsored a test results, it had not been tested in a clinical setting. A written consent form was signed by each owner prior to enrolment of their dog. Owners who participated in this study received all surgery-related care at no cost. Dogs were excluded from study consideration if they had prior stifle surgery on the affected limb, bilateral cranial cruciate ligament disease at initial presentation, presence of any stifle pathology unrelated to the cranial cruciate ligament disease, any perceived skeletal conditions that might impair the ability to securely affix the synthetic ligament or affect healing, active systemic or local infection(s), or any concurrent physical conditions that would limit the dog’s ability to recuperate. Accurate medical records were maintained and clinical, radiographic and technical data were collected. Signalment, history, and physical examination findings were recorded. Examinations were performed by one of the two surgeons (MB or KM) and included a general physical examination and a subjective evaluation of lameness using a visual assessment five-point (0–4) lameness scoring system (Table 1). Dogs were diagnosed with cranial cruciate ligament disease if they had any cranial drawer, cranial tibial thrust, or both present on examination. Table 1. 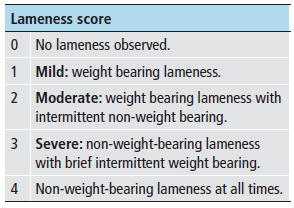 Five-point lameness scoring system used for visual assessment before and following surgery. Preoperative craniocaudal and lateral radiographic projections of the affected stifles were evaluated while dogs were under general anaesthesia to ensure that no additional abnormalities were present. The anaesthesia protocol was not standardized. Dogs were premedicated with a combination of hydromorphone (0.1 mg/kg IV) and either midazolam (0.1 mg/kg IV) or acepromazine maleate (0.1 mg/kg IV) 15–20 minutes prior to induction with propofol (4 mg/kg IV). Anaesthesia was maintained with isoflurane and oxygen. Every dog received a preservative-free morphine (0.1 mg/kg) and bupivacaine (0.5 mg/kg) epidural. Cefazolin (22 mg/kg IV) was administered ≤20 minutes prior to skin incision and every 1.5 hours thereafter until surgery was complete. Lactated Ringer’s solution was administered (10 mL/kg/hr IV) during surgery. The synthetic ligament was a composite polymeric device composed of a multi-filamentous ultra-high molecular weight polyethylene terathalate core contained within a braided porous non-expanded polytetra fluoroethylene (NE-PTFE) sheath. The two components were joined together using 1–0 polyethylene terephthalate suture and 4 cm of cross-stitch pattern made in both ends of the synthetic ligament. A single strand of radio-opaque nitinol thread was woven into the core of the implant to serve as a radiographic marker (first 25 cases only). Tapered polyolefin introducer sheaths at each end facilitated passage through the bone tunnels (Figure 1). Implant sterilization was performed using a proprietary cold chemical sterilization technique. Figure 1A. The composite polymeric device used as the cranial cruciate ligament replacement. The 4 cm immediately adjacent to the tapered introducer sheaths was cross-stitched (circles) to improve holding by the spiked washers. Figure 1B. Close-up appearance of the cross-stitched areas. Prior to this study, company-sponsored a physical and biological testing of the synthetic ligament was carried out in accordance with U.S. National Institutes of Health ‘‘Guide for the Care and Use of Laboratory Animals” and the Animal Welfare Acts (US PL 89–544; 91–579; 94–279) (see Appendix I: available online at www. vcot- online. com). Details regarding the surgical procedure have also been included in Appendix II (available online at www. vcot-online. com). The affected limb was aseptically prepared for surgery and patients placed in dorsal recumbency. A betadine-impregnated adhesive drape c was applied. A 2–3 cm medial parapatellar arthrotomy was performed and a complete joint evaluation performed. Torn medial menisci were debrided while intact menisci were left undisturbed. 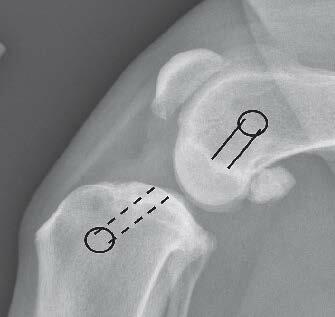 Following cranial cruciate ligament removal, the amount of cranial drawer was recorded as follows: absent = 0 mm, slight = 2–3 mm, moderate = 4–5 mm, and severe cranial drawer >5 mm. An aiming device d was used to introduce a 20 cm 2.0 mm drill bit into the cranial portion of cranial cruciate ligament origin to exit at the level of the lateral fabella (Figure 2 A). Figure 2A. The femoral bone tunnel (solid lines) was started in the origin of the cranial cruciate ligament to exit the lateral metaphyseal cortex at the level of the proximal pole of the lateral fabella. The tibial bone tunnel (dotted lines) was created at the medial aspect of the tibia to exit within the footprint of the cranial cruciate ligament insertion. The desired angle was approximately 60 degrees to the articular surface of the tibia with the lateral edge of the tunnel passing in line with the tip of the lateral spine of the intercondylar eminence (star) in the axial plane (A). Lateral view (B) of femoral (solid lines) and tibial bone tunnels with entrance/exit points (circles). An incision was made over the exiting drill bit and a 4.5 mm cannulated drill bite advanced over the 2.0 mm drill bit until it exited within the cranial cruciate ligament origin. A tibial bone tunnel was created in a similar fashion starting at the proximal-medial tibia and exiting within the cranial cruciate ligament insertion (Figure 2 B). Figure 2B. Lateral view of femoral (solid lines) and tibial bone tunnels with entrance/exit points (circles). Edges on the femoral and tibial tunnel articular apertures were debrided and the synthetic ligament was passed through both bone tunnels. A 3.2 mm drill bit was advanced perpendicular to the long axis of the femur just proximal to the metaphyseal bone tunnel. A bicortical 4.0 mm self-tapping cortical screw e accommodating a 14 mm spiked washer e was placed through a slit created in the synthetic ligament. The 316L stainless steel screw and washer combination was tightened firmly to affix the ligament to the femur. A 5.0 mm titanium interference screw e was selected to occupy the maximum amount of the femoral tunnel. The tibial end of the synthetic ligament was grasped with needle drivers and tensioned to remove slack. An aperture dilatore was introduced to compress the synthetic ligament within the femoral tunnel and the screw was inserted using a driver-tunnel guide instrument e (Figure 3). Figure 3. Interference screw (5.0 mm) tunnel guide/driver combination instrument. The hexagonal portion of the shaft (circle) acted as the driver. The knee was flexed and extended 10 times with the synthetic ligament under tension to remove slack. The same process for the interference screw and screw and spiked washer placement was repeated for the tibia. Proper synthetic ligament placement was confirmed when, during stifle range of motion, there was no impingement of the caudal cruciate ligament, interference within the femoral notch, and no cranial drawer present. Routine closure was performed. Immediate postoperative craniocaudal and lateral view stifle radiographs were obtained (Figure 4). Figure 4A. Immediate postoperative lateral view. Figure 4B. Craniocaudal radiographs following placement of the synthetic ligament. A wound dressing f covered the surgery site until the dogs were discharged. Patients received cefazolin (22 mg/kg IV) eight hours after the initial preoperative dose and either hydromorphone (0.05 mg/kg IV) or morphine (0.5 mg/kg IV) if additional analgesia was needed. Cephalexin (22 mg/kg orally [PO] every 8 hours), as well as firocoxib (5 mg/kg PO once daily), carprofen (2.2 mg/kg PO every 12 hours), or deracoxib (1–2 mg/kg PO once daily) and tramadol (3–5 mg/kg PO every 8 hours) were administered for seven days postoperatively. The choice of drugs was based on what was being administered when the patient was presented for surgery. Owners were provided with instructions to progressively increase their dog’s activities over four weeks (see Appendix II: available online at www. vcot-online.com). All dogs were presented at the end of four weeks following surgery for examination (awake and sedated) after which they could resume unlimited normal activities. All dogs were re-evaluated at eight and 24 weeks following surgery in a similar fashion. Lameness scores were recorded 24 hours and two, four, eight, and 24 weeks postoperatively. Dogs were sedated with acepromazine maleate (0.07 mg/kg IV) and assessed for cranial drawer instability at four, eight and 24 weeks postoperatively. Craniocaudal and lateral view stifle radiographs were obtained at 24 weeks following surgery. Any complications observed were recordedand classified as minor or major using previously published definition recommendations (24). Fifty client-owned dogs met the inclusion criteria and 42 completed the 24 week study. Eight dogs were removed at various postoperative intervals because of complications. The most common breeds were mixed, (n = 24), Labrador Retriever (n = 12), and Rottweiler (n = 4). The mean patient body weight was 34.4 kg (median: 34.5 kg; range: 21 – 47 kg) and mean age was 5.3 years (median: 5 years; range: 1 –11 years). Thirty-four out of 42 dogs experienced significant improvements in lameness between the preoperative and 24 week time periods and at all time intervals after postoperative week 2. Lameness scores also increased significantly over the period between weeks 8 and 24 compared to weeks 4 and 8. The percentage of dogs in which the severity of lameness worsened after week 2 was not significantly greater than zero. Recurrence of stifle instability increased significantly over the study period and occurred in seven of 42 of dogs by week 4 and 18/42 by week 24. Correlations between lameness and cranial drawer scores were negligible for the 0–4 and 0–8 week time periods. However, for the zero to 24 week time period, higher cranial drawer scores were associated with higher lameness scores (Table 2). Table 2. The percentages (95% confidence intervals) of dogs in which the lameness scores improved or declined between the second week post-surgery and four, eight, or 24 weeks post-surgery, and whether the cranial drawer scores improved or declined between immediately post-surgery (0) and four, eight, or 24 weeks post-surgery. Note that cranial drawer was absent in all dogs immediately after synthetic ligament placement so no improvement was possible, rather maintaining the absence of cranial drawer instability would be the best possible outcome. Nineteen of the 50 dogs had medial meniscal tears at the time of surgery and one dog was diagnosed with a postoperative meniscal injury. Medial meniscus status at the time of surgery did not significantly affect postoperative lameness nor stifle stability scores. Two patients had transcortical tibia fractures associated with the 4.0 mm cortical screw placement noted on their immediate postoperative radiographs. Both appeared to be fully healed at the 24 week radiographic assessment time. Progressive fragmentation and migration of the nitinol thread occurred in 14/25 dogs (Figure 5). Three dogs showed osseous resorption around their femoral (2 dogs) or tibial (1 dog) interference screws on the 24 week radiographs. No movement of the interference screws was apparent. Figure 5. Six month postoperative lateral projection radiographs demonstrating the progressive fragmentation and migration (white arrows) of the nitinol thread that was woven into the synthetic ligament to serve as a radiographic marker. Complications were recorded and included for evaluation up until 1.5 years following surgery. Overall, 25/50 dogs experienced a total of 32 complications (22 major and 10 minor). Sixteen of the 50 dogs had major complications and nine of the 50 had minor complications (Table 3). Mean time to developing a major complication following surgery was 137.3 days (median: 135.9 days; range: 11–366 days) and 82 days (median: 84 days; range: 5–189 days) for minor complications. All of the dogs treated for major or minor complications were deemed to have satisfactory resolutions based on examination and owner feedback recorded at four to six months following treatment. 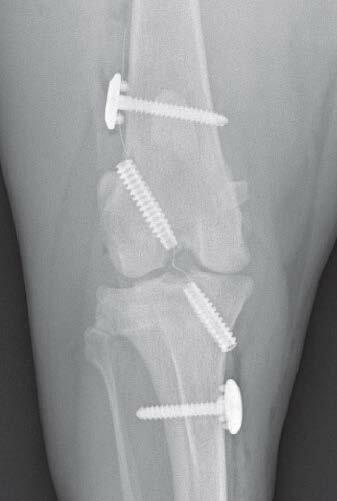 The synthetic ligament implant and technique designed for replacement of the diseased canine cranial cruciate ligament failed to meet our expectation that it could effectively maintain stifle stability. This was despite our attempts to overcome the previous failures of synthetic ligaments by positioning this implant in the anatomical positions of the native cranial cruciate ligament and debriding the edges of the bone tunnel apertures in order to prevent damage due to non-anatomical positioning and fibre abrasion respectively. Additionally, this synthetic ligament was designed to facilitate cellular ingrowth with a non-expanded PTFE outer sheath having pore sizes of 200 microns and linearly arranged core fibres composed of biocompatible materials to help further resist abrasion and improve biologic response (23, 25, 26). 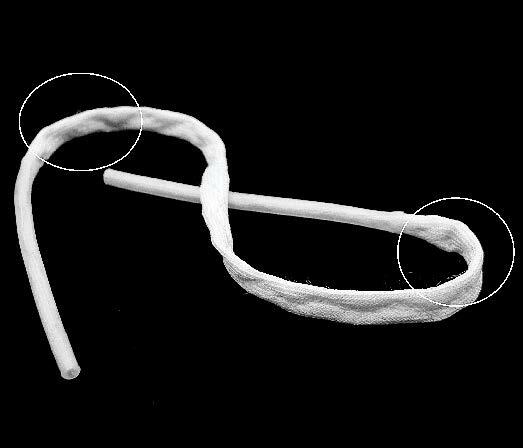 Non- expanded PTFE was chosen because expanded PTFE (Gore-Tex) synthetic ligaments were evaluated extensively in human clinical trials and were determined to be unsuitable in part because of fatigue failures that resulted from poor tissue ingrowth (27). By contrast, NE-PTFE is more amenable to cellular ingrowth because its parallel oriented filaments produce less inter-filament shear compared to the braided expanded PTFE filaments (27). The increased cranial drawer instability that occurred in half of the dogs may have been due to incomplete tissue ingrowth, inadequate strength of initial fixation, a lack of synthetic ligament-bone tunnel interface strength, bone tunnel abrasion, failure of the synthetic ligament itself, or a combination of these. Given our findings in those dogs that required revision surgery, a combination of these issues probably played a role. The majority of ruptured synthetic ligaments evaluated during revision surgery had long remnants protruding from the femoral and tibial bone tunnel apertures suggesting they failed in their mid–intra-articular portions. The core fibres were evenly tensioned in a non-overlapping linear pattern so as to allow them to resist torsional abrasion and shearing because they would “rollover” rather than “crossover” each other when twisted. Additionally, the expected cellular infiltration into the synthetic ligament would have provided additional resistance to inter-fibre shearing (28). Despite these design and fabrication specifications, it appeared that torsional fatigue, a previously described cause of synthetic ligament failure, may have been a contributing cause for failure for this implant (29). We chose a combination of intra-tunnel and cortical fixation methods with the goal of maximizing construct stiffness, improving anatomical placement, and to favour tissue ingrowth. Intra-tunnel fixation with interference screws is a widely used fixation method and may favour tissue ingrowth by preventing intra-tunnel motion (30). Since our patients were to be returned to vigorous activities quickly, cortical fixation was also employed given its described superior stiffness and resistance to graft slippage (31). However, partial loss of internal fixation has to be considered as a potential contributing factor for recurrence of the cranial drawer instability noted. Despite the inability of this technique to prevent recurrence of cranial drawer, the majority of dogs experienced significant improvements in their lameness over the study period. These findings are supported by a previous report of satisfactory outcomes occurring despite the recurrence of cranial drawer instability following surgery (32). The overall 44% patient complication rate for this technique was higher than that reported with other established surgical procedures (33-35). 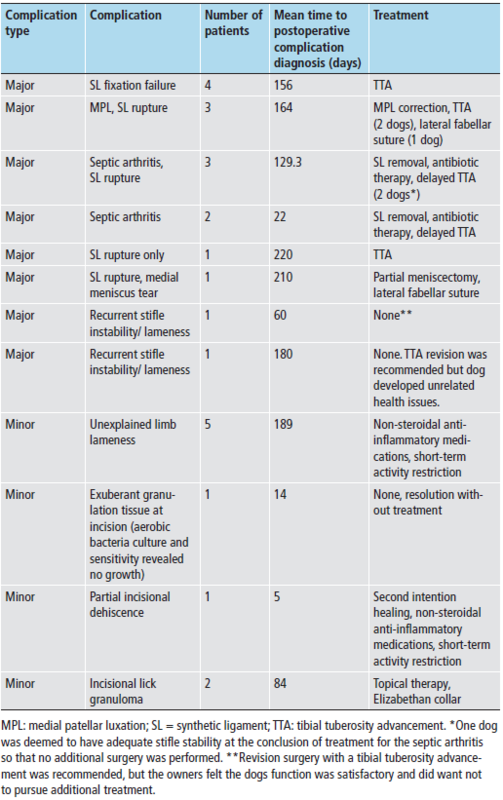 Septic arthritis was the second most common major complication encountered. The open pore implant design meant to facilitate cellular migration within the implant could also allow bacteria to do the same. The presumed migration of bacteria is supported by the observation that all five cases began as superficial subcutaneous infections that progressed to intra-articular despite tailored antibiotic therapy. Any potential benefits of a permanent intra-articular implant must be considered relative to the potentially devastating effects of septic arthritis. The most common postoperative radiographic change noted during the study period was fragmentation and migration of the nitinol thread within the synthetic ligament. The nitinol thread was originally placed within the synthetic ligament to serve as a radiographic marker for evaluating its placement. Use of the thread was discontinued after the first 25 cases because of the observed fragmentation and because its presence was deemed to be of limited value. The fragmentation probably had little impact on synthetic ligament rupture since the majority of them occurred after the thread placement was discontinued. The screw-associated saucer-like transcortical fractures of the tibial diaphysis were identical in appearance and location to those previously reported to occur during tibial plateau levelling osteotomy (36). The additional radiographic finding of radiolucency around interference screws, with no radiographic evidence of change in implant position, was associated with recurrence of cranial drawer instability (2 slight and 1 moderate) over the 24 weeks. A previous report on retrieved synthetic ligaments revealed that fibrous scar tissue may form between the implant and the bone tunnels and that osseointegration was inconsistent (28). The extent to which this may have been responsible for recurrent cranial drawer instability occurring over 24 weeks in this study is unknown, but it is a possible contributing factor. No appreciable radiographic evidence of bone tunnel widening associated with excessive intratunnel motion, an osteolytic response to the synthetic ligament, or both together, was observed. Limitations of our study included the subjective evaluation of lameness and cranial drawer scoring and radiographic evaluations. The potential for bias must be also considered given that the surgeons who performed the procedures also did all of the evaluations. It is unknown whether the learning curve of the surgeons with this new technique and instrumentation, as well as the expected variable tension that was applied to the synthetic ligament during implantation, had any impact on our results. Additionally, there was no discrimination in case selection between acute traumatic and chronic non-traumatic cranial cruciate ligament disease which could have impacted the functional outcomes and complications encountered. Lastly, since there was no control group, the significant improvements in lameness scores over time could not be compared to what may have occurred without any treatment. While this novel intra-articular synthetic cranial cruciate ligament implant and technique was generally effective at improving lameness scores, it did not consistently maintain stifle stability and was associated with a high complication rate. Any potential advantages this surgical technique might offer are outweighed by its disadvantages and it cannot be recommended for use in its current form. Table 3. Major and minor postoperative complications after implantation of a synthetic ligament in 50 dogs. The authors would like to thank the Securos Orthopedic Institute for funding this study. M. Barnhart is a paid lecturer for Securos and receives royalties from the sales of some of their products. K. Schankereli is the president of Avalon Medical. H. Wotton is the former president of Securos. The remaining authors declare no current conflicts of interest. Table 1 Five-point lameness scoring system used for visual assessment before and following surgery. Figure 1 The composite polymeric device used as the cranial cruciate ligament replacement. The 4 cm immediately adjacent to the tapered introducer sheaths was cross-stitched (circles) to improve holding by the spiked washers (A). Close-up appearance of the cross-stitched areas (B). Figure 2 The femoral bone tunnel (solid lines) was started in the origin of the cranial cruciate ligament to exit the lateral metaphyseal cortex at the level of the proximal pole of the lateral fabella. Figure 3 Interference screw (5.0 mm) tunnel guide/driver combination instrument. The hexagonal portion of the shaft (circle) acted as the driver. Figure 4 Immediate postoperative lateral (A) and craniocaudal (B) radiographs following placement of the synthetic ligament. 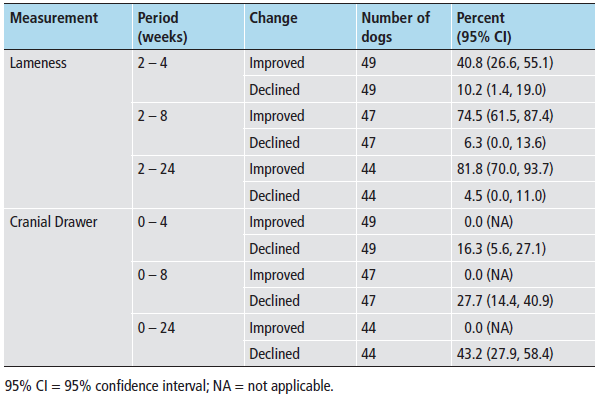 Table 2 The percentages (95% confidence intervals) of dogs in which the lameness scores improved or declined between the second week post-surgery and four, eight, or 24 weeks post-surgery, and whether the cranial drawer scores improved or declined between immediately post-surgery (0) and four, eight, or 24 weeks post-surgery. Note that cranial drawer was absent in all dogs immediately after synthetic ligament placement so no improvement was possible, rather maintaining the absence of cranial drawer instability would be the best possible outcome. Figure 5 Six month postoperative lateral projection radiographs demonstrating the progressive fragmentation and migration (white arrows) of the nitinol thread that was woven into the synthetic ligament to serve as a radiographic marker. 1. Johnson JA, Austin C, Breur GJ. Incidence of canine appendicular musculoskeletal disorders in 16 veterinary teaching hospitals from 1980 to 1989. Vet Comp Orthop Traumatol 1994; 7: 56–59. 2. Ekins AD, Pechman R, Kearney MT, et al. 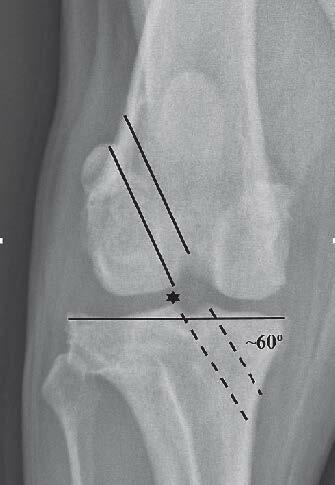 A retrospective study evaluating the degree of degenerative joint disease in the stifle joint of dogs following surgical repair of anterior cruciate ligament rupture. J Am Anim Hosp Assoc 1991; 27: 533. 3. Prodromos CC, Rogowksi J, Joyce BT. The economics of anterior cruciate ligament reconstruction. In: Prodromos CC, editor. The Anterior Cruciate Ligament: Reconstruction and Basic Science. Philadelphia, PA: Saunders; 2008. pp. 79–87. 4. Conzemius MG, Evans RB, Besancon MF, et al. Effect of surgical technique on limb function after surgery for rupture of the cranial cruciate ligament in dogs. J Am Vet Med Assoc 2005; 226: 232–236. 5. Vasseur PB, Rodrigo JJ, Stevenson S, et al. Replacement of the anterior cruciate ligament with a bone ligament bone anterior cruciate ligament allograft in dogs. Clin Orthop Relat Res 1987; 219: 268–277. 6. Lopez MI, Markel MD, Kalscheur V, et al. Hamstring graft technique for stabilization of canine cranial cruciate ligament deficient stifles. Vet Surg 2003; 32: 390–401. 7. Moore KW, Read RA. Cranial cruciate ligament rupture ion the dog a retrospective study comparing surgical techniques. Aust Vet J 1995; 27: 281–285. 8. Patterson RH, Smith GK, Gregor TP, et al. Biomechanical stability of four cranial cruciate ligament repair techniques in the dog. Vet Surg 1991; 20: 85–90. 9. Hulse DA, Butler DL, Kay MD, et al. Biomechanics of cranial cruciate ligament reconstruction in the dog- in vitro laxity testing. Vet Surg 1983; 12: 109–118. 10. Snow LA, White R, Gustafson S, et al. Ex vivo comparison of three surgical techniques to stabilize the canine cranial cruciate ligament deficient stifles. Vet Surg 2010; 39: 195–207. 11. Johnson RJ, Benynnon BD, Nicholes CE, et al. The treatment of injuries of the anterior cruciate ligament. J Bone Joint Surg 1992; 74A: 140–151. 12. Sachs RA, Daniel DM, Stone ML, et al. Patellofemoral problems after anterior cruciate ligament reconstruction. Am J Sports Med 1989; 17: 760–765. 13. Amiel D, Kleiner JB, Roux RD, et al. The phenomenon of “ligamentization”: anterior ligament reconstruction with autogenous patellar tendon. J Orthop Res 1986; 4: 162–172. 14. Ng GY, Oakes BW, Deacon OW, et al. Long-term study of the biochemistry and biomechanics of anterior cruciate ligament-patellar tendon autografts in goats. J Orthop Res 1993; 14: 851–856. 15. Vassuer PB, Griffey S, Massat BJ. Evaluation of the Leeds-Keio synthetic replacement for the cranial cruciate ligament in dogs: an experimental study. Vet Comp Orthop Traumatol 1996; 29: 66–74. 16. Rooster HD, Vangheluwe L, Bree HV, et al. Biomechanical properties of braided polyester tapes intended for use as intra-articular cranial cruciate ligament prostheses in dogs. Am J Vet Res 2001; 62: 48–53. 17. Denny HR, Goodship AE. Replacement of the anterior cruciate ligament with carbon fibre in the dog. J Small Anim Pract 1980; 21: 279–286. 18. Johnson FL. Prosthetic anterior cruciate ligament. J Am Vet Med Assoc 1960; 137: 646–647. 19. Barrett GR, Line LL, Shelton WR, et al. The Dacron ligament prosthesis in anterior cruciate ligament reconstruction. A four year review. Am J Sports Med 1993; 21: 367–373. 20. Woods GA, Indelicato PA, Prevot TJ. The Gore-Tex anterior cruciate ligament prosthesis: two versus three year results. Am J Sports Med 1991; 19: 48–55. 21. Ventura A, Terzaghi C, Legnani C. Synthetic grafts for anterior cruciate ligament rupture: 19 year outcome study. The Knee 2010; 17: 108–113. 22. Huang JM, Wang Q, Shen F, et al. Cruciate ligament reconstruction using LARS artificial ligament under arthroscopy: 81 cases report. Chin Med J 2010; 123: 160–164. 23. Trieb K, Blahovec H, Brand H, et al. In vivo and in vitro cellular ingrowth into a new generation of artificial ligaments. Eur Surg Res 2004; 36: 148–151. 24. Cook JL, Evans R, Conzemius MG, et al. Proposed definitions and criteria for reporting time frame, outcome, and complications for clinical orthopedic studies in veterinary medicine. Vet Surg 2010; 39: 905–908. 25. Kock HJ, Sturmer R, Letsch R, et al. Interface and biocompatibility of polyethylene terephthalate knee ligament prostheses. Arch Orthop Trauma Surg 1994; 114: 1–7. 26. Barnhart MD, Schankereli KM, Getzy D, et al. In vivo rodent cellular ingrowth into a polytetrafluoroethylene/high tenacity polyester artificial ligament implant. Poster session presented at the 2013 American College of Veterinary Surgeons Symposium; 2013 October 24–26; San Antonio, Texas, USA. Engineering. Cambridge, UK: Woodhead Publishing; 2015. pp. 91–112. 28. 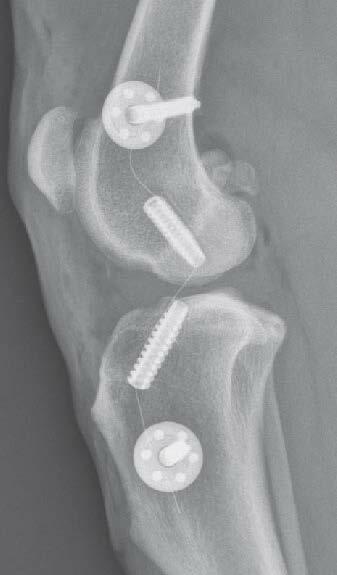 Dericks G. Ligament advanced reinforcement system anterior ligament reconstruction. Op Tech Sports Med 1995; 3: 187–305. ACL. Biomaterials 2000: 21: 2461–2474. 30. Rodeo SA, Arnocsky SP, Torzilli PA, et al. Tendonhealing in a bone tunnel. A biomechanical and histological study in the dog. J Bone Joint Surg 1993: 75A: 1795–1803. 31. Eagar P, Hull ML, Howell SM. How fixation method stiffness and initial tension affect anterior load-displacement of the knee and tension in anterior cruciate ligament grafts: a study in cadaveric knees using a double-loop hamstrings graft. J Orthop Res 2004: 22: 613–624. 32. Budsberg SC, Verstraete MC, Soutas-Little RW, et al. Force plate analyses before and after stabilization of canine stifles for cruciate injury. Am J Vet Res 1988: 49: 1522–1524. arthrotomy in 1000 consecutive dogs. Vet Surg 2010: 39: 460–474. 34. Stein S, Schmoekel H. Short-term and eight to 12 months results of a tibial tuberosity advancement as a treatment of canine cruciate ligament damage. J Small Anim Pract 2008: 49: 398–404. 35. Casale SA, McCarthy RJ. Complications associated with lateral fabellotibial suture surgery for cranial cruciate ligament injury in dogs: 363 cases (1997–2005). J Amer Vet Med Assoc 2009: 234: 229–235. 36. Boekhout C, Cross A. 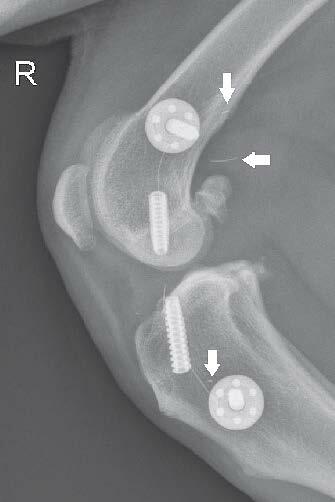 Incidence of transcortical tibial Fractures with self-tapping and non-self-tapping screws in a canine TPLO model. Vet Surg 2012: 41: 898–901.